Tubular drag conveyors are designed according to customer and place in system in which it is fitted. They are used when the material has to be transported over a long distance with no damage. Our team of engineers is able to respond to the most varied customer requirements. 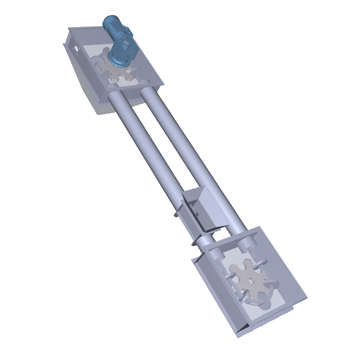 Our tubular drag conveyors angle conveyors are used in all industries. How to use 3D Gallery? First step is to select the model clicking on the picture of the model. The second step is that in the drop-down menu, which will open on the left, select the color of model. Then you will open a 3D view where you can get further guidance on the control of model. You want to send us a message related to Drag conveyors. Call us at +381 11/42-80-617 or fill out the following form.